Since our release Tuesday of our Google Academics Inc. report, we have heard a wide range of feedback. We wanted to address the points made in one place. Many, if not most, agreed with the need for us to shine a light on Google’s funding of academic research with a bearing on the policy sphere, and of corporate funding more generally. Some sent Google-funded papers that should be included in the database; other academics objected to the inclusion of their work in the tally of papers and took issue with aspects of our methodology. Some authors felt that only those who had directly received Google money should be included. They argued that working for an institution that receives funding from Google should not merit inclusion in the list. However, we felt that would give an incomplete picture of the ways in which Google funds academic research that can advance its public policy positions. Google funds many universities, programs and departments, and our analysis of correspondence obtained through open-records requests makes clear that many academics at places like George Mason University are regularly called upon by Google’s public policy office to aid its positions, even if they do not receive funding as individuals. Studies have found that “other types of financial ties besides direct sponsorship can have an effect on results,” so omitting them would obscure the ways in which Google attempts to influence research. Excluding papers by authors at Google-funded institutions would also encourage companies to exploit an easy loophole to avoid disclosure: they simply route the funding to the institution that employs them instead of the academic themselves. We therefore decided to include such cases, but distinguish them in the data so that users can filter out that category if they prefer. Others argued that they shouldn’t be included in the database because it was their co-author on the paper that had benefitted from Google funding—not them. We felt it was important to include any paper with at least one author that had received Google funding directly or indirectly. Otherwise, most papers by Google-funded authors would be excluded from the database by virtue of having at least one non-Google-funded co-author. Therefore, the database entry clearly spells out who the funded author is, and the co-authors did not become Google-funded authors in subsequent papers by virtue of having their paper included in the database. Other authors argued that while they may have been funded by Google for one paper, that doesn’t mean they are Google-funded authors for all eternity. We felt the readers would want to know which authors had a previous funding relationship with Google, particularly as much funding is not specifically attached to an individual paper. The idea that only funding for each individual paper must be disclosed and that any other funding received by the author must not, seemed to us to be far too narrow, and risks misleading the reader. For example: an author that has been funded by Google to write five papers on a subject close to Google’s heart could clearly be influenced on the sixth paper on the subject. The scholarship in the sixth paper will also inevitably be informed by the first five, and the prospect of further future funding remains. We think the reader of an academic paper wants to know if the author has benefitted from Google funding in the past, not just whether funds had been earmarked for the specific paper they are reading. Finally, some authors who received Google support wanted to know why we didn’t include their work in the database. In some cases, it was a genuine oversight – we tried to be as comprehensive as possible, but we know that we missed some papers. In other cases, the authors’ papers were excluded because we determined them to be technical in nature and not relevant to Google’s public policy interests. Papers about apps, algorithms, networks, and the like didn’t make the cut unless they ventured into policy issues. In any research undertaking of this size, there are bound to be imperfections and disagreements over the methodology. In this case, the research was limited to data in the public record. It was further limited because of the subjective nature of academic disclosure itself. As we reported, there is no single standard for disclosure of Google funding. In some cases, funding was disclosed in academics’ curriculum vitae; in others it was disclosed as footnotes or on academics’ personal blogs. In some cases, funding was in fact disclosed in final versions of research papers, but not in earlier or draft versions available on research sites such as the Social Science Research Network. We have set out our methodology here and encourage anyone analyzing the data to please let us know if you notice any errors or omissions so that we can promptly address them. Here are some of the individual complaints we received and our thoughts on them. Annemarie Bridy, an affiliate scholar at the Stanford Center for Internet and Society was included in our database as receiving indirect funding for two papers she wrote in 2016: Copyright’s Digital Deputies: DMCA-Plus Enforcement by Internet Intermediaries and Three Notice Failures in Copyright Law. The Stanford Center for Internet and Society receives substantial Google funding—the reason for her inclusion. However, Ms. Bridy noted in an email to the Campaign for Accountability that she receives no compensation from the Stanford Center for Internet and Society for her “affiliate scholar” position. Some pointed out that the affiliation itself has a non-monetary value for the academic, but this database is about funding. As a result, we have decided to remove her papers from the database. Aaron Perzanowski, a co-author of two papers with UC Berkeley professor Jason Schultz tweeted that he was included in our database three times and “has never received a penny from Google.” Mr. Perzanowski is correct and both the database and the methodology reflect that fact: the “Funding Details” section correctly shows that the database entry is for Mr. Schultz—not Mr. Perzanowski. He also argues that the $200,000 in Google funding came from a cy pres award to Samuelson Law, and was not a direct contribution. Google’s use of cy pres awards has been described as a way for the company to direct funds to academics and policy groups that support its public policy views. That is why we included Google’s cy pres support in our data: it has served as another form of funding for organizations that advance Google’s policy goals. Mr. Perzanowski also tweeted that he was included in the database because his co-author, Jason Schultz, previously worked at the Electronic Frontier Foundation (EFF). Again, Mr. Perzanowski is not included in our database as having accepted Google funding. Google has funded many of the employers of his co-author, Mr. Schultz, including the Samuelson Law, Technology and Public Policy Clinic and EFF. The two organizations received $1.2 million in Google funding through the cy pres award mentioned above. Mr. Schultz also practiced intellectual property law at the firm of Fish & Richardson, PC, which counts Google as a major client on patent matters. Lastly, Mr. Perzanowski noted that the Copyright Exhaustion and Personal Use Dilemma paper he co-authored with Mr. Schultz was authored in 2011, before our notation of Google’s cy pres award to EFF and the Samuelson Law, Technology and Public Policy Clinic in 2012. Mr. Perzanowski may be partially correct, though the timing of both events is somewhat unclear. The cy pres award was given in 2012 but approved in May of 2011. The date of final publication of the paper is unclear, with some versions listing publication in 2011 and others in 2012. In any case, Google contributed at least $25,000 to Schwartz’s employer in 2010 (and probably far more overall) so it seems safe to say that his employer was funded by Google. Again, Mr. Solove was not listed as a Google-funded academic in the database. The funding detail shows he co-authored three papers with Paul Schwartz, who received a Google Faculty Research Award in 2011. Daniel Crane, a professor at the University of Michigan, emailed to point out that while The Wall Street Journal story and the Google Transparency Project correctly noted that he did not receive Google funding, he was disappointed that we included public records information about his discussions with Google on search neutrality. Our purpose in including those emails was to show how aggressively Google approaches academics to offer funding in return for favorable research funding. As noted in the report, Mr. Crane apparently rebuffed Google’s request. He notes in his email that he spoke with different companies opposed to Google in order to “understand the policy positions of the different players in this space.” We note his concerns and did not intend to imply that his conversations with Google compromised his objectivity in any way. Dan Pemstein, a professor at North Dakota State University emailed to alert us that the database incorrectly noted that his paper, Google Politics: The Political Determinants of Internet Censorship in Democracies, did not include a full disclosure of direct Google funding. He explained that, because of his concern about revelations of inappropriate financial links between Google and academics, he has insisted on full transparency of all Google funding for any of his work. Mr. Pemstein is entirely correct—his paper does include such a disclosure. We regret the error, will correct the entry and update the data accordingly. We also incorrectly stated that Nicolo Zingales' paper, Internet Intermediary Liability: Identifying Best Practices for Africa failed to disclose Google funding. The paper does indeed acnowledge Google support, and we have updated the database accordingly. Zingales also noted that we included a paper that was published before his Google Policy Fellowship began in our dataset. We have removed this paper from the dataset. Casey Fiesler and Sarah T. Roberts, both former Google Policy Fellows took issue with being included in the database given that the papers they authored were published several years after their policy fellowship. The issue of whether to include Google Policy Fellows in our dataset was one that we debated before publishing our research. On the one hand, Ms. Fiesler and Ms. Roberts raise valid points about whether a small Google stipend for a policy fellowship should constitute “indirect” Google funding for subsequent research projects that support Google’s policy positions. On the other hand, Google Policy Fellowships are given to promising students (and future academics) precisely to influence their thinking and ultimately their future scholarship. In other words, there’s a reason Google funds policy fellowships, and the size of the financial benefit isn’t a reason to exclude it. For example, University of Maryland professor Frank Pasquale has suggested that every paper should disclose funders, and that even small dollar amounts can have a major impact. We agree and believe that adding a citation disclosing current and past funding from corporate interests who stand to benefit from the policy research in question should be the norm, no matter what the size of the donation. James Losey, another Google Policy Fellow, rightly points out that we included his 2014 Google Policy Fellowship as indirect funding for a paper that he co-authored in 2011i. This was an oversight on our part, and we regret the error. But because another co-author on that paper, Victor Pickard, did receive a policy fellowship in 2008, the paper will remain in the database – but we no longer list Mr. Losey as a funded author. Pickard himself reached out to us to object to his inclusion in the database on the basis that his policy fellowship does not translate to Google influence three years later. As discussed above, we decided to include policy fellowships because they are a part of Google’s effort to promote its interests among emerging thought leaders. Clearly, Google offers these policy fellowships for a reason: It buys good will from the recipient and the policy group chosen to host them. Paul Ohm, who helped direct the Center on Privacy and Technology at the Georgetown University Law Center, tweeted the opposite concern, that he wasn’t included in the data even though Google provides financial support to the Center. Ohm’s concern provides perhaps the best example of the problem researchers face in identifying corporate funding of academic research. Neither Google nor the Center on Privacy and Technology appear to disclose that Google is a financial supporter. Unlike the Stanford Center for Internet & Society, which prominently discloses its current and past funders on its “About” page (although it does not disclose the amounts), the Center on Privacy and Technology includes no obvious disclosure. We appreciate Mr. Ohm’s new disclosure and will add the Center on Privacy and Technology to our database. We encourage other academics who were omitted in error to let us know. The answer is that our focus is on how Google uses academic sponsorship to advance its public policy goals. We restricted our database to topics of interest to the company’s policy office, and excluded the many thousands of papers on technical issues relevant to its regular business, such as those in the field of computer science. Sorry! Sascha Meinrath at the University of Pennsylvania and Barbara van Schewick at the Stanford Center for the Internet and Society (CIS), objected that they were included in our database even though they did not receive money directly from Google for their academic research. Stanford wrote that, although CIS had received a $2 million gift from Google, “none of the Center’s resources are used to pay for [her] work,” noting that as a faculty member, her salary, research support, and travel are funded through the general budget of the law school and are independent of CIS. We think this is too fine a distinction. Money is fungible and so dollars taken out of one university budget leaves more dollars in another. The reader of the paper needs to know if the author, or their employer generally, have received funding from Google. In this case, the reader has no confidence that Google’s funding of CIS is unrelated to Ms. van Schewick’s work on policy issues of interest to the company. As the data notes, Ms. van Schewick has written at least seven studies supporting net neutrality— long a key policy issue for Google. First, as with the Mr. Perzanowski example above, Mr. Meinrath was not a subject of our study. Based on the information available at the time of publication, his name was only listed in the full citation for studies in which he was a co-author along with an academic receiving Google funding. 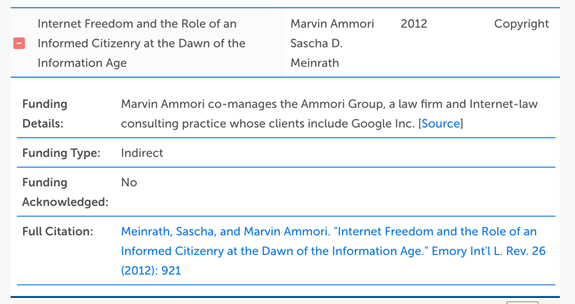 The “Funding Details” in the example below shows that the subject of our inquiry was in fact Marvin Ammori, a paid Google consultant. That said, had we known that Mr. Meinrath received Google funding for other projects, he would have been included in our data. While we appreciate his point about direct funding for specific research differing from indirect money provided for other projects, we find the distinction to be largely meaningless from the point of view of the reader. How can she have confidence that a paper is not influenced by payments the author is receiving in connection with another project? He was also one of four academics specializing in Intellectual Property law that issued a Call to Action in 2016 suggesting improved disclosure of corporate funding in the research area, which is of great importance to Google and other companies. It called on colleagues to disclose all relationships with companies (including indirect payments to universities and relationships with law firms). Other academics say that even more fulsome disclosures are not enough—they simply shift the risks on to the reader of the paper. We believe these are all important points but more fulsome disclosure would certainly be a good start and academics should strive to be as informative and open to readers as possible, and not too narrow in their interpretations of what constitutes industry funding. i Our database initially listed the publication date of this paper as 2010, because it comes from the 2010-2011 issue of CommLaw Conspectus. An author informs us that the actual publication date was 2011.